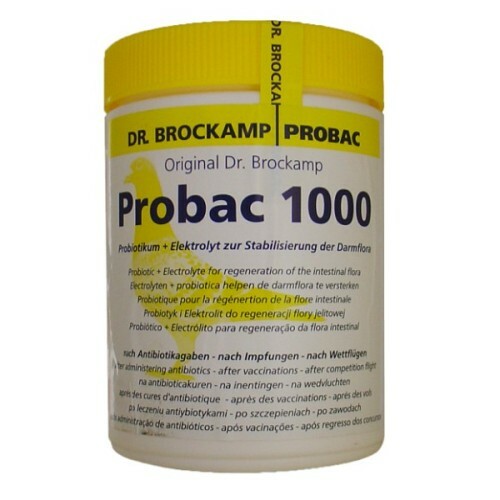 Probac 1000 by Dr. Brockamp is a Probiotic Electrolyte for the regeneration of intestinal flora. Stress, dietary changes or antibiotic therapy rapidly leads to changes in the natural intestinal flora. Food is no longer digested optimally, the immune system is weakened and the pigeon loses its ability to repel intestinal diseases. 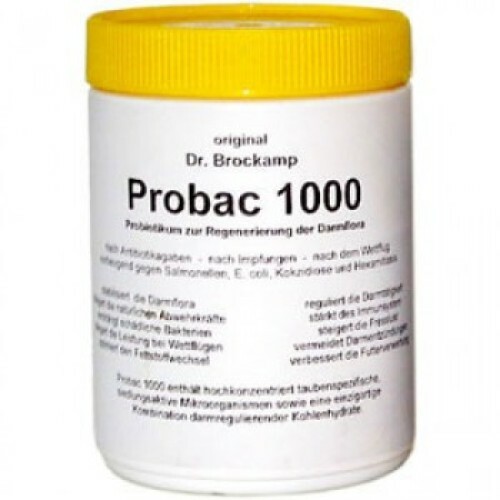 The regular application of Probac 1000 increases natural resistance to disease and pathogenic bacteria such as coccidian, hexamites, E.coli, candida and salmonellae, and thus deter intestinal diseases. - Twice weekly 5g of Probac 1000 in 1 litre of water or 1 kg of feed for 25 pigeons per day. - Following antibiotic treatment, Probac 1000 should always be administered for 3 – 5 days to replace destroyed intestinal flora. After immunisations for paramyxoviros, Paratyphus, or pox, Probac 1000 is superbly suited to alleviating the reaction to the immunisation in the pigeon and inducing growth in the damaged intestinal flora.